It seemed a little weird to me to have the story end with this voiceover dialogue from Tylo, as opposed to some sort of direct scene with the Brimia crew talking or doing something. There’s no last joke from Cember or “let’s get going” line from Roka or anything like that. But I really liked the content of Tylo’s voiceover and how it covers everything from Roka’s past mistakes, to hints about the trouble Sky will bring, to an acknowledgment of the crew being a great team, and ending with a nod to all the great adventures to come for them. So I was willing to keep the voiceover as is at the expense of any last sign-off from the crew itself. I don’t live in their universe and I don’t know those alien races, and aliens would definitely have different facial expressions from humans, but in panel 3 I _know_, from Roka’s expression, the he just got “punched in the gut”. Just like in panel 4, from Sky’s expression, I _know_ that she is seeing the same expression on Roka’s face that I’m seeing. 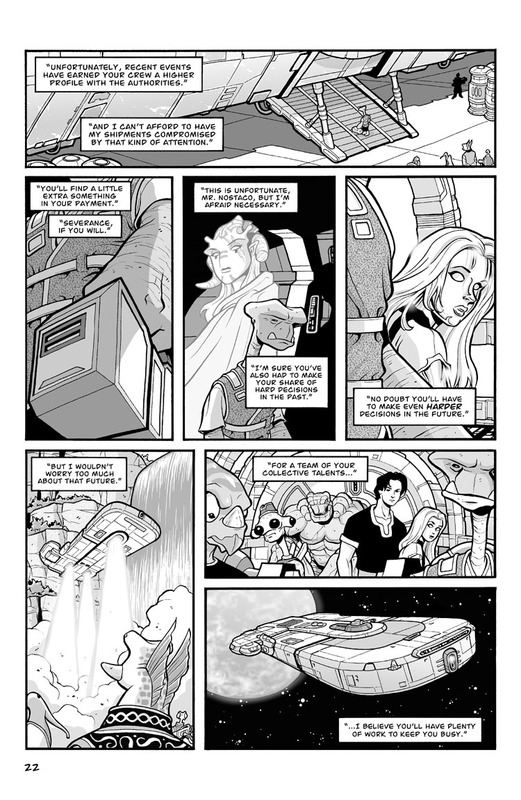 And, the voiceover from Tylo works great on this page. I think you made an excellent decision keeping it, even if it’s not a “typical” ending page. Thanks Joe! Glad to know the voiceover worked for you. And it’s also good to know that the facial expressions conveyed what I wanted. I’m generally a big fan of letting the art show what the character is going through without having to necessarily rely on dialog, so it’s nice to have these silent moments every now and then. Who knows, maybe someday I’ll do a full story (or at least a short story) that’s completely silent. That would be fun. And it would save me some time at the lettering stage! I was half expecting a fire fight of some kind. You know, the whole gangster gets rid of employee by death thing. I’m glad it’s not like that, gives Tylo a much more interesting character. It’s always nice to see a crime boss who actually has class. I like my crime bosses to have a bit of restraint. Whenever I see a psycho unpredictable boss, I just never quite believe that anyone would feel safe enough to follow that kind of leader for long. In Breaking Bad parlance, I guess I like them more Gus Fring and less Tuco Salamanca. Although the Tucos can be highly entertaining! Plus I couldn’t go and kill my team leader in the first story arc, could I? That’s something for the second story arc. Ha ha. Just kidding. Or am I? I agree 100% with Joe from Denver. It works perfectly.